The story of Rome's greatest general. As told by one of Britain's greatest story-tellers. 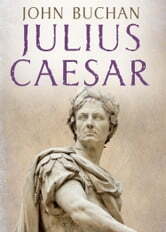 Caesar was the most daring and successful of Roman generals, and one of its finest statesman. In this romantic biography Buchan attempts to understand the mind and motives of the great soldier. He tells the story of Caesar's youth, early political career, military success, his conquest of Gaul and of the world, and the deadly political intrigues that ended with his murder at the hands of Brutus and the Republican-minded conspirators. It is a thrillingly involving biography, told by the author of the Richard Hannay thrillers that are among the early classics of the genre. John Buchan was a Scottish novelist, historian and Unionist politician who also served as Governor General of Canada. He is most famous for his classic thriller, 'The 39 Steps'.